Chimney flue repair may be necessary if you have clay flue tiles inside your masonary chimney that are cracked or busted. If a busted tile is located, or you see a mortar joint between the tiles beginning to fail, it's important to repair it as soon as possible. A properly maintained chimney not only functions better, it dramatically reduces the possibility of harmful fumes entering your home or even worse, a deadly fire. As a fire burns, the combustion process creates carbon monoxide, creosote and other chemicals that need to be vented outside your home. Even a small crack can allow these chemicals to seep into your house. Plus, these small cracks in the flue liner allow creosote to form on the outside of the flue liner. If this creosote were to catch fire, there's an increased risk of catching the rest of your house on fire since the fire is no longer contained inside the flue. There are 3 basic places to check when inspecting your chimney. First, the mortar joints between each section of clay tile can erode over time leaving large gaps between the tiles. Excessive heat, moisture and chemicals can all cause the mortar to break down and eventually fall apart. Second, the clay tiles themselves can actually crack or break. Weather, poor construction and even the settling of your home over many years can eventually cause a clay tile to crack or break. Third, check the inside lining of the clay tiles for spalling. Spalling occurs when moisture or corrosive chemicals cause the inside clay lining to flake apart from the inside out. The lining will look rough or pitted as opposed to smooth and flat. Spalling is usually found near the top of the chimney because that's where condensation typically occurs. 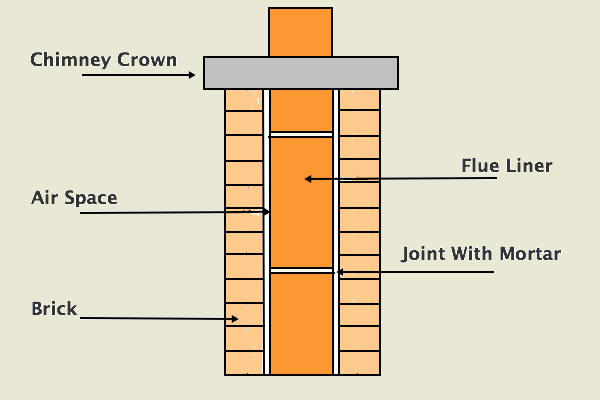 The picture above shows the construction of a basic chimney. The flue liner runs through the center surrounded by air space and then the exterior brick. The chimney crown sits on top which shelters the chimney from rain and snow. The clay tiles located near the top of the chimney are usually the first ones to fail since they are exposed to the greatest temperature changes. 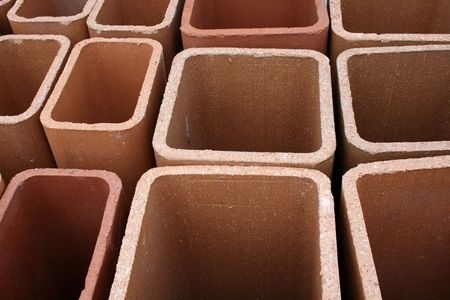 The clay tiles are typically square shaped and 24'' long. If you can safely stand on your roof, inspect the upper sections of the tile for damage and check the mortar joints. Since you won't be able to reach very far down into the chimney, you'll only be able to access the top 1 or 2 clay tiles but these are usually the first ones to fail. Repair any broken tiles by replacing it with a new one, or repair the mortar joints by adding mortar to the exposed joints. If you only have damage to the top portion of the flue you can usually fix it yourself. If you see damaged tiles further down inside the chimney you may need to contact a professional since the repair will be more involved. If you notice several cracks through the entire flue and replacing the clay tiles is not an option, you can choose to have a professional service create a new flue by placing a mold inside the flue then pumping cement around it. The process involves putting an inflatable mold/bladder down the chimney. Spacers are placed between the bladder and the existing flue then the bladder is inflated. Cement is then added to the space between the bladder and the existing flue. Once the cement is dry, the bladder is deflated leaving behind a new flue. 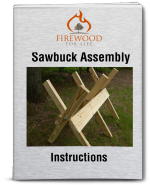 The cast-in-place method is not a do-it-yourself option. It requires special equipment, however, once finished you will have new chimney liner that functions like new.....or even better. 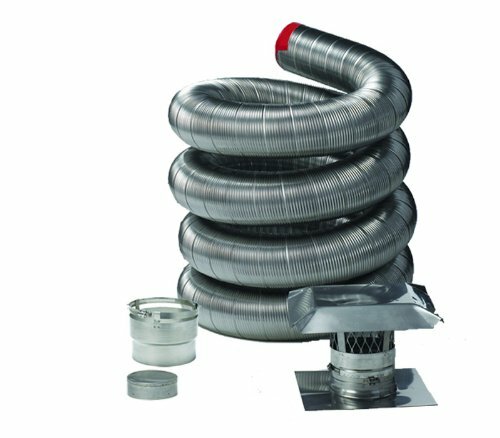 When considering chimney flue repair, stainless steel liners are a popular option. The liners are available in many different shapes and sizes making them very versatile. One of the biggest advantages of a stainless steel liner is their ability to bend and accommodate an offset chimney. You can purchase stainless steel liners in either a rigid or flexible model. There's typically a debate over which model is easier to clean.......the rigid or the flexible option which has a corrugated interior. While there will always be mixed opinions, many experts agree the flexible liners will expand and contract better allowing buildup to flake away and not adhere to the liner walls. Most of the commonly used flue liners can be purchased as a kit which includes the necessary insulation, fittings and hookups for either your fireplace, wood stove or furnace. While some chimney flue repair can be completed yourself, you should have an experienced professional inspect your chimney to make sure it's free from any defects you can't detect on your own. Video cameras and other equipment make it possible for a professional service to detect imperfections that may not be visible to the average homeowner. A clean, proper functioning chimney flue will not only work better, but it will be safer and reduce the possibility of an unwanted chimney fire in your home.